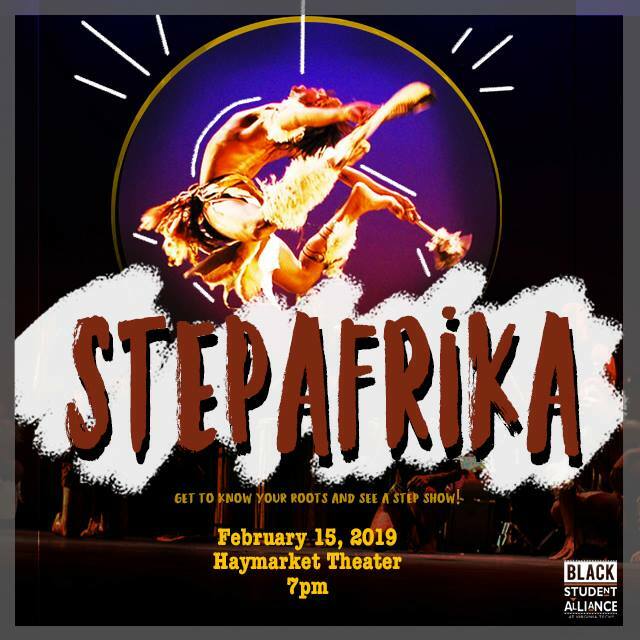 The Black Student Alliance at Virginia Tech presents a performance from Step Afrika! on Friday, February 15, 2019 at Haymarket Theater located within the Squires Student Center on the campus of Virginia Tech. Step Afrika! is a dance company who focuses on the African American traditional of stepping. Come out to watch this amazing, team of dancers put on a high energy, interactive and entertaining performance! Step Afrika! is the first professional dance company in the world dedicated to the African American tradition of stepping. Founded in 1994, Step Afrika! is listed as one of the Top Ten African American dance companies in the United States. Step Afrika! 's programs introduce young people of all backgrounds to the art form of stepping, an exciting contemporary American dance genre. Emphasizing teamwork, discipline and commitment, the Company enhances the lives of youth with programs that engage and inspire them to make positive choices. Step Afrika! performs at more than 50 US Colleges and Universities each year, using stepping to promote the arts and commitment to higher education. The Company's college shows feature highlights from Step Afrika! 's repertoire, an introduction to the history of stepping and a lot of audience participation. To view the event flyer, visit: https://i.imgur.com/fEqWy5d.jpg. For more information, visit: https://ccc.vt.edu/awareness/History_Heritage_Months/Black_History_Month.html or https://www.facebook.com/BSAatVT.